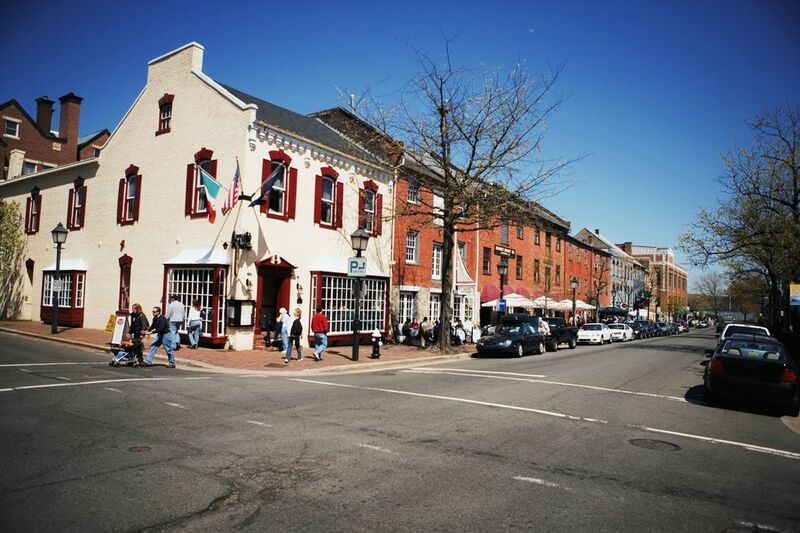 The holiday season in Old Town Alexandria is magical with historic streets brightly decorated, entertainers on street corners drawing a crowd, and festive events that create lasting memories. You and your family can explore the holiday festivities, which take place from King Street in Old Town Alexandria to Del Ray's nostalgic Mount Vernon Avenue, and you're sure to find something fun that everyone can enjoy this November and December. Fortunately, the City of the Alexandria makes getting to and around Old Town easy with the free trolley that travels from the King Street Metro to the Ramsay House Visitors Center at 221 King Street, returning to the Metro with stops along the way. Passes for free parking at 2-hour meters are also available for out-of-town visitors at the Visitors Center. The official Christmas tree of the City of Alexandria will be set up from Thanksgiving through New Year's Eve in the Historic Market Square in Old Town (301 King Street) in honor of the holiday season. However, the kick-off event for the year is the annual Tree Lighting Ceremony, which will take place on the Friday after Thanksgiving this year starting at 6 p.m. You and your family can enjoy musical entertainment, caroling with a community sing-along, and greetings from the mayor and Santa Claus, who will lead the lighting ceremony. George Washington's Mount Vernon Estate will be adorned with themed decorations — complete with a gingerbread model of the estate — and offer a series of historical chocolate-making demonstrations and 18th-century dancing lessons throughout the holiday season. You can also visit Aladdin (George Washington's Christmas Camel), take special mansion tours, and even make a chocolate toast to Christmas at the estate this holiday season. For a complete schedule of events, visit the Christmas at Mount Vernon website. One of the most popular events of the holiday season, the Annual Campagna Center Scottish Walk Weekend, will take place throughout Old Town Alexandria from November 30 to December 1, 2018, and hundreds of Scottish clansmen with their bagpipes will gather for the annual parade will take place at 11 a.m. on December 1 this year. The 48th Annual Scottish Christmas Walk Weekend also includes a tour of historic homes and a Christmas Marketplace and Café, which features the annual "Taste of Scottland" sample event. The Torpedo Factory Art Center in Old Town features dozens of artists' studios and is the home of several museums and businesses including the Alexandria Archaeology Museum and the Portside entertainment district. Throughout the month of December, these venues will host a series of holiday events including a Ship Biscuit Ornament Making workshop on December 1 from 1 to 4 p.m. at the Archaeology Museum; Storytime With Santa on December 15 from 3 to 4 p.m. in the main hall of the Torpedo Factory Art Center; and First Night Alexandria on December 31 from 2 to 5 p.m.
On December 8, 2018, from 4 to 9 p.m., you can tour Historic Alexandria in all its Christmas glory as part of one of the annual Old Town Candlelight Tours, which will feature candlelit tours of four festively decorated historic sites in Old Town. This year's tours will include Gadsby's Tavern Museum, the Carlyle House, and the Lee-Fendall House. Additionally, George Washington's Mount Vernon Estate and Gardens, Gunston Hall, and Woodlawn Plantation will also host festive events in historic settings throughout the month. If you'd like a bit of a history lesson to go with your holiday cheer, you can stop by the Fort Ward Museum and Historic Site on December 8, 2018, from noon to 4 p.m. for the annual Civil War Christmas in Camp event. You can experience the festive sights and sounds of Christmas during the Civil War at this popular family event that features living history, live musical performances from the period, decorations, refreshments, and guided tours of the fort. Clad in colonial attire, the Colonial English Handbell Ringers will perform at the Lyceum History Museum on December 16, 2018, from 2 to 4 p.m. This year's holiday concert "Bells in Toyland" features songs for all ages including "A Song of Gladness," "Frosty the Snowman," "Parade of the Wooden Soldiers," and "The 12 Days of Christmas" like you've never heard it. There will be two shows this year, and tickets are free but only available on a first-come, first served basis. After the success of its first year open for the holiday season in 2017, Christmas Illuminations returns to Mount Vernon on December 14 and 15, 2018 (Rescheduled to December 22, 2018). This special event features a holiday-themed firework display as well as tours of the historic estate. Before the fireworks show begins at 8:45 p.m., guests can watch colonial artisans make chocolate, meet re-enactors from the First Virginia Regiment, enjoy cider by a bonfire, and learn 18th-century dance moves from costumed guides. To close out the holiday season, you can stop by the waterfront in Alexandria for a very unique holiday tradition that first made its appearance in 2017: Waterskiing Santa Claus. Holiday enthusiasts can gather at the waterfront for a spectacular show by the Waterskiing Santa and his wakeboarding reindeer, plus flying elves, the Grinch and his friends, Frosty the Snowman, and Jack Frost on December December 24, 2018, at 1 p.m. The best places to view the Waterskiing Santa Claus event are from Waterfront Park, Alexandria City Marina, Founders Park, and Point Lumley Park; Waterfront Park will have music and announcements broadcast over a sound system during the event.